What’s Happening in North Carolina? I am honored to be joining the Delta Kappa Gamma Chapter in Hickory this evening to share current initiatives from the North Carolina Department of Public Instruction as well as the latest news about the changing face of education. North Carolina teachers need professional development now more than ever before. With new curriculum standards, professional development standards that are but a few years old, and a changing pedagogical landscape, professional development is not only needed but necessary. Click here to view my presentation for The Governor’s Education Transformation Commission. Professional Development comes in all different shapes and sizes. During the 2012-13 school year, the length of the school year was extended to 185 days. North Carolina school districts could opt for a waiver for five extra days and use those days for professional development rather than student days. The majority of NC schools did opt for the waiver and has used the days to provide professional development for their educators. NC Educator Modules provide NC educators with differentiated professional development. One method of professional development is through the North Carolina Professional Development Modules. These modules can be self-paced, facilitated by a local facilitator, or completed in small groups. Summer Institutes provide yet another opportunity for NC Teachers to receive professional development. Webinars are also used by all divisions at DPI to disseminate information. Webinars are archived for participants who cannot join them in real-time. Each division houses webinars on their individual wikis. With so much “new” in our state, educators were reeling without some organizational structure in place to help them know where to go to find information. Wikicentral was created to help NC educators find what they are looking within a matter of clicks. Click here to access wikicentral. 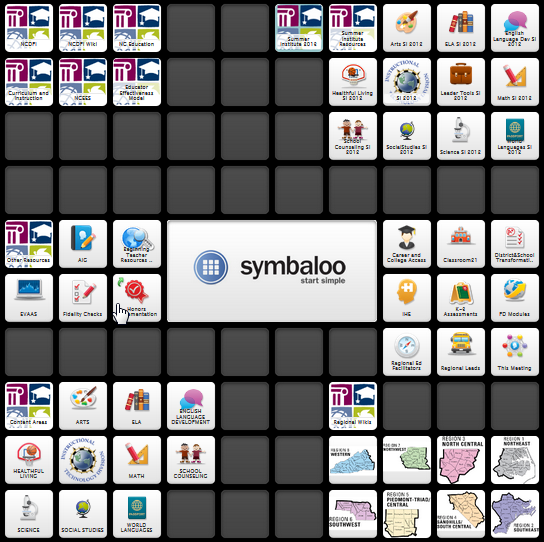 The Wikicentral Symbaloo provides NC educators with a one-stop shop platform for information from DPI. A great deal of emphasis today is on educator effectiveness and assessment. North Carolina has adopted a sixth professional teaching standard for teachers and an eighth professional teaching standard for principals. 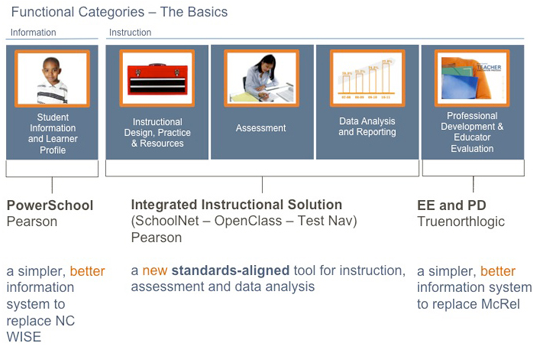 These standards will use value-added data to determine educator effectiveness. State standardized tests and common exams will be administered and evaluated to determine an educator’s effectiveness. Click here to learn more about common exams. Click here to see a sample presentation. Click here to see a beginning-intermediate training on EVAAS. Home Base is a statewide, instructional improvement (IIS) and student information system (SIS) for teachers, students, parents and administrators. Teachers will be able to use Home Base to access student data and teaching and learning resources. Students will be able to access their schoolwork, grades, and learning activities. Parents will be able to view their child’s attendance and progress, and administrators can monitor data on students, teachers and schools. Not only does Home Base put data and resources at the users’ fingertips, it does so with single sign-on access to the integrated system made up of the following components: Learner Profile and Student Information; Standards & Curriculum; Instructional Design, Practice & Resources; Assessment; Data Analysis and Reporting; and Professional Development & Educator Evaluation. If you are interested in learning more about Home Base, you can access all Home Base webinars by clicking here. Excellent Public Schools Act SB 337- (Senator Berger) – This bill has two parts. The senate bill does away with career status/tenure for public school teachers and positions the state for merit pay. A new bill came out from Senator Berger – mandating the 10 point grading scale – moving away from the criteria model. Dr. Atkinson and other DPI leaders met with House and Senate leaders across the state to share with them that the model currently in place does not accurately represent the state of our schools. House Bill: HB 719 now competing with SB337 – (Representative Holloway) – The house bill is better for schools in terms of the grading. One element of the house bill is a waiver for class size. Voucher Bills: HB 269: Currently, two voucher bills exist. One is for EC students -parents can take money and use it for enrollment in private school. Private schools do not have to adhere to IEPs to meet students’ needs. There is currently discussion around parents having choice to pull students out of public schools since they know the needs of their children best. This voucher passed. Second Bill – Public school money may be used to fund parochial or religious schools. This is the beginning of opening the door for wherever students go, money follows them. Both bills are a cause for concern. A major concern is the fact that private schools often cannot accommodate the physical, social, emotional, and exceptional needs of all students. Terms to Know: tax credit, scholarship, and voucher are being used interchangeably. #NCed chat is a bi-weekly Twitter chat for North Carolina educators and others who are interested in or invested in education. #NCed Chat will provide an opportunity for North Carolina educators to grow and develop their personal learning network (PLN) by connecting to other NC educators throughout the state . The chat will create a forum for North Carolina educators to come together once every other week in a public Twitter conversation around topics that pertain to their work and connect with other educators with similar interests. The chats will be primarily moderated by school and district level practitioners. By incorporating the NC Department of Public Instruction into the chats, NCDPI can receive real-time feedback from educators across the state on issues that they are facing and best practices that are yielding positive results. Additionally, incorporating NCDPI into the chats will allow NCDPI to provide expert insight into issues, strategies, resources, etc. that are being shared and discussed in the chat. The chat is not intended to be a NCDPI responsibility, but instead it is intended to be a peer sharing approach for NC educators that NCDPI can supplement. Check out our #NCed flyer to learn about upcoming chats. Check out archived chats by clicking here. If you would like more information about NC Initiatives, feel free to contact me. Looking for Basic Information? Try Qwiki!